Renal failure may complicate the course of hematologic malignancies. Chronic myelomonocytic leukemia (CMML) is an uncommon and complex blood cancer that very rarely affects the kidney. 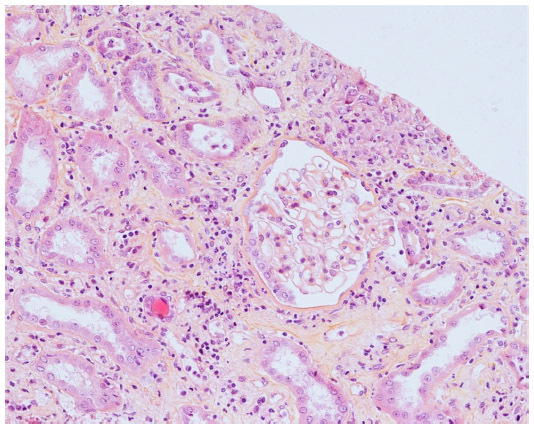 We present a case of progressive CMML-associated renal failure caused by acute tubulo-interstitial nephritis (ATIN) due to infiltration of neoplastic myelomonocytic cells. The Ethical Committee of The University Hospital Brussels approved the study, but does not require patient consent for case presentations. A 76-year-old man was admitted with intermittent high fever, polyuria, heavy fatigue, and excessive nocturnal transpiration. In 1 month, he had lost 5 kg of weight. He suffered from arterial hypertension, hypercholesterolemia, and ischemic cardiomyopathy and took acetylsalicylic acid, bisoprolol, atorvastatin, and occasionally sildenafil. He denied recent contact with sick people, traveling to tropical regions, or use of nonsteroidal anti-inflammatory or illicit drugs. Except for two home-held canaries, he was not exposed to animals. Six months before admission, a routine blood test showed mild normocytic anemia (hemoglobin 11.7 g/dL) with normal ferritin levels. At that time, no further diagnostic work-up was performed. Physical examination on admission was normal. Relevant blood results are given in Table 1. Microscopic urinary examination showed pyuria but no hematuria or protein loss. Chest X-ray was normal. Contrast-enhanced abdominal computed tomography scan revealed enlarged edematous kidneys with preserved corticomedullary differentiation. Subsequent transesophageal echocardiography excluded endocarditis. Intravenous fluid and antibiotics were initiated. Abbreviations: CRP, C-reactive protein; LDH, lactate dehydrogenase. Under this treatment, pyuria and inflammation persisted, and serum creatinine rose to 5.13 mg/dL. Fever peaks up to 40°C were documented. Extensive additional screening for viral, bacterial, and parasitic disease was negative. Antinuclear antibodies, anti-neutrophilic cytoplasmatic antibodies, and cryoglobulins were not detected. Complement levels were normal. Serum and urine protein electrophoresis was consistent with a nonspecific acute phase response. Bence-Jones protein was not detected. Serum and urinary lysozyme levels were normal. A bone marrow aspirate and trephine biopsy were performed which showed dysgranulopoiesis and a hypercellular marrow, particularly populated with mononuclear cells and their progenitors. The karyotype was normal. BCR-ABL1 fusion transcript and rearrangements of the platelet-derived growth factor receptors A and B were negative. The bone marrow contained 17.5% blasts which confirmed the presence of CMML-2. 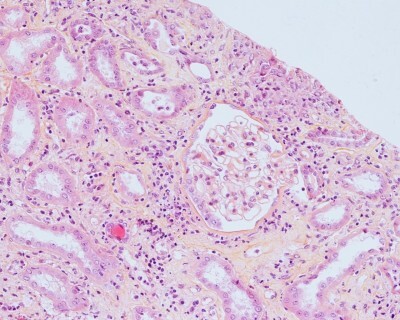 In light of the patient’s atypical disease presentation characterized by galloping clinical and renal deterioration, a kidney biopsy was performed. Light microscopic examination showed interstitial infiltration with monocytic and reactive lymphoid cells. Focal lymphocyte infiltration of the tubular epithelium was observed. This “tubulitis” was in part associated with degenerative tubular changes. Glomerular or (peri)vascular inflammation was not seen (Figure 1). Blast cells were not detected. Interstitial fibrosis was absent. Monocytes occasionally formed interstitial aggregates simulating microgranulomas (Figure 2). Immunofluorescence microscopy could not detect immune and complement deposits. Acid-fast, Periodic Acid-Schiff, and Gomori methenamine silver staining remained negative. Figure 1 Kidney biopsy (×200). Notes: Hematoxylin and eosin staining showing interstitial infiltration with myeloid and monocytic cells. The glomeruli are morphologically normal. Figure 2 Kidney biopsy (×200). 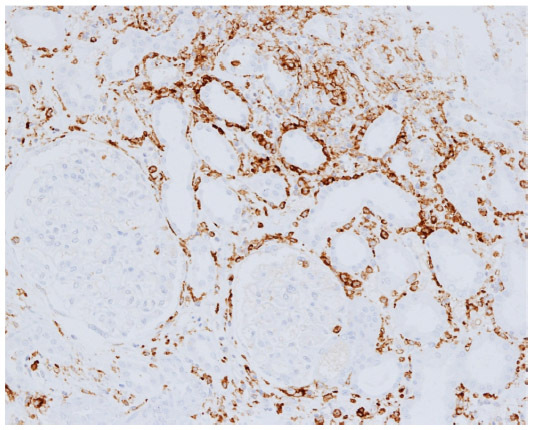 Notes: Immunohistochemical staining for CD14 is positive in the numerous mature monocytes present in interstitium and around tubuli and glomeruli. Monocytes sometimes form aggregates simulating microgranulomas. Antibiotics were stopped, and treatment with high-dose steroids (methylprednisolone 1 mg/kg/day) and hydroxycarbamide (500 mg/day) was initiated. Serum creatinine level subsequently decreased to 1.93 mg/dL. The patient’s clinical condition steadily improved and fever subsided. After 10 weeks of progressive dose de-escalation, methylprednisolone was withdrawn. Kidney function further improved. Leukocyte and platelet counts remained stable, but anemia persisted, necessitating repeated packed cell transfusions. Treatment of ATIN aims at controlling the underlying disease and/or eradicating the inciting agent.8 Since no randomized controlled trials comparing ATIN treatment have been conducted, the therapeutic approach should be individualized. Treatment of the hematologic malignancy may improve renal dysfunction induced by leukemic cell infiltration, but it remains unclear to what extent kidney function is resolved. Hydroxycarbamide remains the cornerstone of therapy for CMML patients with an elevated leukocyte count. The DNA-methylation inhibitors, azacitidine and decitabine, have been approved for treatment of patients with myelodysplastic syndromes. Several Phase II studies reported a good overall response of CMML to treatment with these hypomethylating agents. However, the retrospective and non-comparative nature of these trials precludes to draw definite conclusions.1 Allogeneic stem cell transplantation offers the best chance for long-term remission but remains controversial due to the lack of efficacy studies and the high comorbidity of an often elderly CMML population.1 Finally, comprehensive molecular profiling of CMML has identified a wide array of specific clonal mutations. This provides CMML with a unique genomic identity opening interesting diagnostic, therapeutic, and prognostic perspectives.10 Corticosteroids are commonly administered to patients with ATIN. Yet, outcome results are conflicting, and many issues remain unanswered (eg, mechanism of action) or topic of debate (eg, optimal dose and duration of therapy).11 Our patient responded well to a treatment combining high-dose steroids and hydroxycarbamide. Unless formally contraindicated (eg, infection-induced ATIN), steroid therapy should be considered in patients with ATIN whose kidney function fails to improve after attempting to control or eliminate the culprit disease or if vasculitis is evidenced. In conclusion, ATIN secondary to myelomonocytic tubulo-interstitial infiltration should be included in the differential diagnosis of renal failure in CMML. If suspected, a renal biopsy must be considered to establish the diagnosis and to determine disease type and stage. Renal dysfunction is potentially reversible under treatment. We are indebted to Kristin Jochmans, MD, PhD, Department of Laboratory Hematology, Universitair Ziekenhuis Brussel, Vrije Universiteit Brussel, Brussels, Belgium, for additional advice. Parikh SA, Tefferi A. Chronic myelomonocytic leukemia: 2013 update on diagnosis, risk stratification and management. Am J Hematol. 2013;88:968–974. Vardiman JW, Thiele J, Arber DA, et al. The 2008 revision of the World Health Organisation (WHO) classification of myeloid neoplasms and acute leukemia: rationale and important changes. Blood. 2009;114:937–951. Patel TV, Rennke HG, Sloan JM, DeAngelo DJ, Charytan DM. A forgotten cause of kidney injury in chronic myelomonocytic leukemia. Am J Kidney Dis. 2009;54:159–164. Robinson GT, Sundaram KR, Dilly SA, Bevan DH, Andrews PA. Renal failure in a patient with chronic myelomonocytic leukemia. Nephrol Dial Transplant. 1997;12:1500–1502. Enriquez R, Sirvent AE, Marin F, Pérez M, Alpera MR, Amorós F. Severe renal complications in chronic myelomonocytic leukemia. J Nephrol. 2008;21:609–614. Hyams ES, Gupta R, Melamed J, Taneja SS, Shah O. Renal involvement by chronic myelomonocytic leukemia requiring nephroureterectomy. Rev Urol. 2009;11:33–37. Otrock ZK, Taher AT, Mahfouz RA, Makarem JA, Shamseddine AI. Acute tumor lysis syndrome secondary to hydroxycarbamide in chronic myelomonocytic leukemia. Am J Hematol. 2006;81:220–221. Praga M, González E. Acute interstitial nephritis. Kidney Int. 2010;77:956–961. Kobayashi K, Yokote T, Tsuji M, Takubo T, Inoue T, Hanafusa T. Renal infiltration associated with chronic myelomonocytic leukaemia. Br J Haematol. 2009;147:414. Padron E, Abdel-Wahab O. Importance of genetics in the clinical management of chronic myelomonocytic leukemia. J Clin Oncol. 2013;31:2374–2376. Praga M, Sevillano A, Auñón P, Gonzáles E. Changes in the aetiology, clinical presentation and management of acute interstitial nephritis, an increasingly common cause of acute kidney injury. Nephrol Dial Transplant. 2015;30:1472–1479.